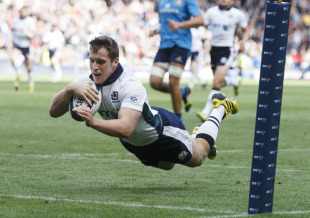 Mark Bennett scores Scotland's sixth try. Scotland finally injected some momentum into their World Cup preparations as they followed up last week's win over Italy with a 48-7 triumph in the Edinburgh return. Doubles from Sean Lamont and Tim Visser combined with scores from John Barclay and Mark Bennett ensured Vern Cotter's team gained revenge for this year's last-gasp RBS 6 Nations defeat to the Azzurri. But the hosts will be annoyed with themselves after Visser's mistake allowed Michele Campagnaro to touchdown for the visitors before half-time. That Murrayfield defeat to Jacques Brunel's men was one of six straight losses suffered by Scotland at the start of 2015 but with less than a month to go until they face Japan in their Pool B opener, they will feel they are motoring now. Five tries, an impressive display at the scrum and a flawless line-out in front of a record summer Test crowd of 43,831 was just what Cotter wanted to see after last week's nervy 16-12 win in Turin. His starting XV bore a distinct 'first choice' look but for flankers Barclay and Ryan Wilson, it was their last chance to stake a claim before the head coach names his 31-man squad on Tuesday. And it was Scarlets man Barclay whose hopes will have been raised most after a solid outing in the second row. Two huge scrums in the opening skirmishes were just what the hosts were looking for as they put Italy prop Martin Castrogiovanni under immediate pressure, with Laidlaw nailing his first penalty. The Italians soon found themselves in more trouble as Scotland's pack continued to dominate the set-piece. After a couple of patient phases, Finn Russell clipped the ball out to the wing for Lamont to gather, beat Guglielmo Palazzani and scampered in for the score. After Laidlaw put the additional two points over it was all looking rather positive for a team which only won its first match of 2015 last week, with Stuart Hogg and Visser looking especially in the mood. Laidlaw nailed another couple of penalties as the Italians continued to do themselves no favours with their indiscipline. Even when they did finally put something on the scoreboard, there was something of a farce about it. Allan's up and under should have been easily dealt with by Visser, but when the Dutch-born winger slapped the ball onto Laidlaw's head, it fell into Campagnaro's grasp for a gift of a try, with the error compounded by Allan's conversion. But there was further encouragement for Scotland when Francesco Minto was sin-binned just before half-time for bringing down a maul. With the flanker off the field, his opposite number Barclay was able to collect a line-out and barge over for Scotland's second score, again converted by Laidlaw. Visser made amends for his mistake after 48 minutes as the Scots were rewarded for taking touch instead of a very makable penalty. Another perfect line-out set the platform as the hosts went through the phases before Russell switched it wide to Visser, who dotted his eight Scotland try down in the corner. Laidlaw failed to add the extras but knocked a penalty over soon after. Things went from bad to worse for Italy when Quintin Geldenhuys' attempt to find Samuela Vunisa flew into Lamont's hands, leaving the 34-year-old to run his for his second try - his 14th overall for his nation. This time his captain did convert. Luke McLean then giftwrapped Scotland's fifth score as he passed straight to Visser, who out sprinted Campagnaro in a 80-yard foot race. Russell added the additional points after taking over kicking duties. Mark Bennett then sealed a stunning display with try number six as he also darted the length of the field to score, although Russell could not add the extras.